Dec. 02, 2014 + + + Russia has decided against the construction of the 930-km South Stream natural gas pipeline across the Black Sea from Russia to Bulgaria, citing delays on the part of the European Union in taking the steps necessary to move forward. Press reports have OAO Gazprom Chief Executive Alexei Miller as confirming the decision originally announced by Russian President Vladimir Putin. Miller and Mehmet Konuk, chairman of Botas Petroleum Pipeline Corp., signed a memorandum of understanding Dec. 1 on instead building an offshore gas pipeline from the Russkaya compressor station (also South Stream’s starting point) under construction in the Krasnodar Territory across the Black Sea to Turkey. Putin and Turkish President Recep Erdogan witnessed the signing. Turkey in July had approved South Stream’s environmental impact assessment, including pipelay for the 63-billion cu m (bcm)/year project’s four parallel strings in its exclusive economic zone starting first-quarter 2015 (OGJ Online, July 25, 2014). The new pipeline would have the same 63 bcm/year overall capacity, with 14 bcm/year to be used in Turkey and the balance shipped to a border crossing with Greece, the location of which has yet to be decided. The 448-Mw Russkaya station will provide as much as 28.45 MPa of pressure, enough to have shipped gas on South Stream to Bulgaria without intermediate compression. Meanwhile, Saipem, a unit of Italy’s Eni SPA, released a statement saying that it had not yet received any formal notice of termination of its contract with South Stream Transport BV. Pipelay for South Stream Line 2 using the Saipem 7000 was due to start in mid-2015, with first gas flow from Line 1 following later that year (OGJ Online, May 12, 2014). Turkey is Gazprom’s second-largest natural gas sales market behind Germany. 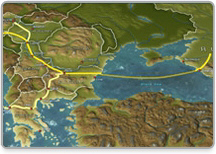 Gazprom shipped 26.7 bcm to Turkey last year via the Blue Stream and Trans-Balkan pipelines.